Your left hemisphere is the analyst. What holds you in the past, or what you need to do in the future - your left hemisphere keeps track of all the details of the energy that your right hemisphere is receiving. The left hemisphere is also the one that defines you. It’s the internal dialogue that tells you you exist as an entity separate from the rest of the universe’s energy. So think about it - what would happen if you were to take away the left hemisphere? Remember, the left hemisphere is the one that defines the boundaries of your individual energy. If you were to take away the left hemisphere, but spare the right hemisphere, these boundaries would be broken, and the right hemisphere would be free to expand your boundaries into the universe. That is, your life energy would feel at one with the energy of the universe. They would become indistinguishable. If this is sounding abstract and a little new-agey to you, here’s another way to think of it. I imagine it is similar to the thinking behind “the force” in the Star Wars universe. 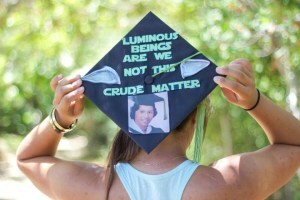 It “surrounds us, combines us; luminous beings are we, not this crude matter.” (which incidentally was what I put on my graduation cap; see photo)Conversely, the left brain is the non-Jedi mind, stuck in the selfish thought process that “I am the only energy that I can experience, so therefore I am the only energy that matters.” It sounds harsh, no one wants to think of themselves as being selfish, but think about it; you tend to not care about experiences that don’t involve you, am I right? If two of your friends go out without you, it’s not so fun to hear about their good time, because you did not experience it with them. Also think about this: imagine what a giving, compassionate, loving world it would be if we didn’t have our left hemispheres separating our energy from the rest of the universe’s energy? To sense what other energies are experiencing - how could you NOT empathize with them? Obviously, this cannot realistically happen; the left hemisphere is also the home of other important brain centers. But why can’t be loosen the reins a little, so to speak, on our right hemisphere? All you have to do is tune yourself into the energy, and changes in energy, around you, and stop thinking of yourself as a being higher or separate from that energy; it is all the same. Ok, so let’s step back a little now. How does this have anything to do with clicker training? While it may not help you teach your horse every single trick possible, building a relationship founded on your right hemisphere’s intuition can help change your entire perspective on horse training, and your relationship with your horse. Your horse can sense changes in energy much better than we can hope to, but being in tune with these changes can at least help you understand what the horse is feeling. 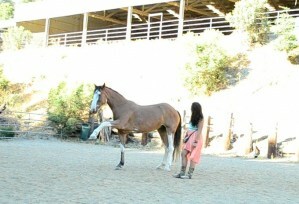 The way you conduct yourself is a huge source of energy that your horse can detect. Body language is a part of this. If I open my arms down and out to my sides, and bend over a little, Moxie perceives this as me opening up my energy, calmly, and inviting her energy closer to me. On the other hand, if I raise my arms out to my sides and “push” out at her, she senses that I am protecting myself, and projecting my energy out at her to keep her at bay. Don’t forget: your facial expressions are a part of your energy! As I pull her energy towards mine, I open myself up including my face, and I make my face pleasant and happy. As I push her away, I may frown, or furrow my brow. The same works in projecting your energy up or down. When I gather my energy lower and then lift it up, Moxie responds to it by rearing. If I keep my energy grounded, and ask for a lower energy upwards movement with only one side, Moxie responds with a jambette (paw). As you watch this video, try to notice my shifts in energy and how Moxie responds. I have purposely not added any spoken dialogue to this video, as there are truly no words to explain what must be shown and experienced. Play aroundwith your changes in energy during your training sessions; it may feel overly dramatic at first, but eventually it will become second nature, as both you and your horse learn to better interpret each other's energies.